When American Eagle Systems set out to design an interface for mobile filing systems, the engineers at American Eagle's Long Island, NY research facility took a unique approach. AES wanted to ensure that conventional thinking did not get in the way of design integrity. Unlike other manufacturers who try to alter their existing systems, AES designed their new electronics from the ground up. The goal was a state of the art interface with unsurpassed safety and security access features, operator friendliness, extreme reliability while still being price competitive. The AES Logic Plus electronic interface is unique in appearance, and its large size makes operation quite easy. 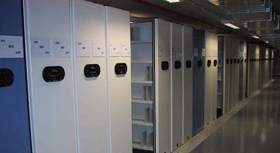 The electronics are state of the art, designed and built to ISO 9000 standards. The special QS 9000 standard from the automobile industry is acknowledged. Time Saving Performance: Faster carriage movement by decreasing driving distance which improves production by 75 percent. Transponder Technology:Simple conversion of mobile and fixed carriers. Easy Touch Buttons & No Moving Parts: for life time problem free operation. Simplicity: A total of 3 keys operates all functions of the system. Unlimited Combinations of Security Access Codes: Security is an industry wide concern. AES has also adopted technology used by the automobile industry for years. Different access code levels are programmed into keyless transponder devices insuring the highest level of security, preventing employees from accessing confidential information. Each transponder key is programmed to access specific aisles, thereby preventing access to high security records and media.